Motivation: the guiding force that propels you forward towards your ultimate goal of being extremely awesome at Japanese. Without motivation, you won’t succeed. I’ve talked about this before in detail, as this is a subject that is always continually deserving of your utmost attention. “Motivation sounds obvious. You don’t need me telling you to get motivated. You probably are motivated . . . for now. Motivation is a resource that is voraciously consumed at an incredible pace. You may have had all the motivation in the world at the start of your studies, but watch as it slowly starts to wither away. This is normal. This is bad. You need to prevent this from happening. “To persevere through your continuous adventures in Japanese, you are going to need help. You start off with very little, but like in every video game, you are going to need power-ups. The main arsenal you will encounter will consist of three items: Inspiration, Motivation, and Guidance. I know you are quite familiar with these power-ups. You should be getting them from Japanese Level Up. You’ve gotten them before from many other websites, self-help books, TV shows, friends/family, anime, manga, and movies. They are vital in giving you that extra boost, pushing you towards success in Japanese, and there is no shortage of them wherever you look. Without them, you wouldn’t make it past level 1. You’ve used them this long, but are you using them correctly? Have you forgotten the principal rule behind them? Like any good power-up, they don’t last long. How long? Sometimes a few hours. After your power-up is acquired, it disappears at incredible speed. This means that anytime you activate one, you have very little time to make beneficial use of it before it vanishes. Does this sound familiar? You read a power-up article, you are all pumped up, and ready to rock however it relates to Japanese. You wait until tomorrow to begin. However, tomorrow you don’t feel like doing anything. You just wasted a precious power-up. I’m discouraged and just don’t seem to have the motivation anymore. So most Japanese Personal Advisor sessions, while including specialized guidance and advice, are often strong personal infusions of motivation. Motivation in a variety of areas for a variety of reasons. A supply that is supposed to last. And most people thus like the Personal Japanese Advisor (at least I hope), because of that motivational power burst. 1. Always keep you on the top of your game. 2. Make sure you don’t give up. 3. When you are at your lowest, save you from darkness. We all have our lows, and I want this to be there for you when you reach that next unfortunate moment. What’s inside the treasure chest? Each page contains an original and motivational paragraph written by me, tailored specifically to you, the Japanese learner, in order to get that excitement back where it belongs. I know what you have been through. I’ve been there. And I’ve been seeing it over the years as I have been helping you guys on JALUP. I know what you need. I know what will boost you. I know what you want and need to hear. 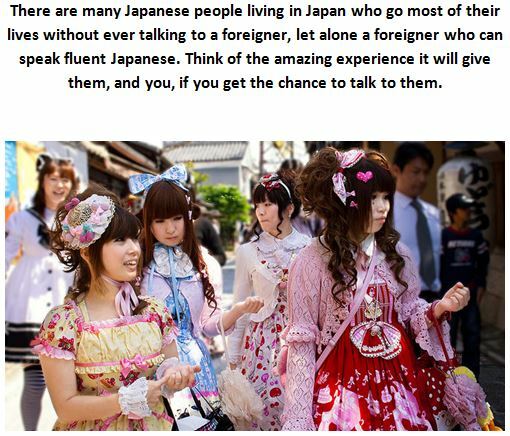 – Reminding you of why learning Japanese is so freaking amazing. – Specific things you can do to infuse that energy back into you. 2. 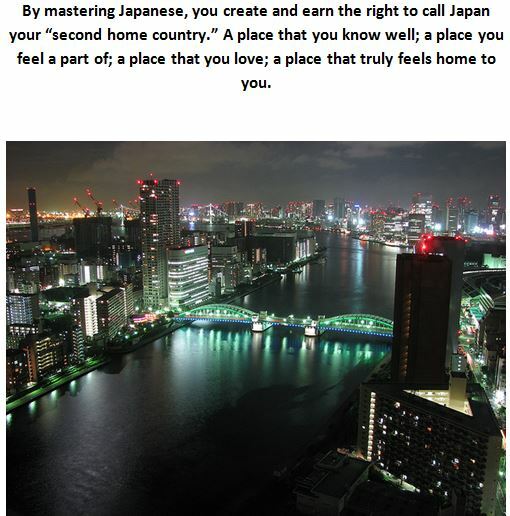 Are just general motivating pictures of Japan. I remember at some of my darkest moments, seeing certain images of Japan reignited the spark and love for Japan and Japanese culture. Visual people sometimes need to feel it. All pictures are licensed from Flickr creative commons (A separate PDF file is included providing credit for all these great photographers.) I went through several hundred pictures to find what really makes you remember your strong feelings towards Japan. Anyone who is feeling down, wondering where to get the energy to move forward, and needs to remember why they love Japan, Japanese culture, and the Japanese language. This is not to be read through in one sitting. Save it for when you really need it and use them one or two at a time. I am giving you 75 chances to recover from a Japanese study defeat. I think it’s time to power up. Ah man, I was starting to get tears from the emotional manga scene one haha, definitely will buy it next payday! It made me realize, though, that I’ve never actually had a serious motivation crisis (and maybe I never will, considering I’m finally at a level where I’m starting to really be able to do some of the things that motivated me in the first place). The sample Power-Ups look great, by the way. If the rest live up to the samples I expect this to be a pretty useful product. If there’s one thing I don’t like so much in the article, though, is the way it seems to define motivation, which I guess is different from the way I think about it. After thinking a bit about it, I guess a good way to put it is the following: the motivation the article focuses on is “short term motivation”, as in “do you feel like putting the work in right now”, and hence this motivation shines brightest in one’s best days; the motivation I tend to focus on, though, is “long term motivation”, as in “do you want it enough that you force yourself to put in the work even when you aren’t feeling that great about it”, a kind of motivation that shines the brightest precisely on the worst of days. It has been this last kind of motivation (and the occasional liberal amount of coffee) that has allowed me to finish my anki reviews in my darkest days, at the end of which I always reminded myself that “those are the days that really count”. Anyway, let me add an amusing source of (short term) motivation I personally found entirely by accident. In my very early days of learning Japanese I signed up for some features of the Japanese 101 website, and though I eventually stopped using that website altogether I still receive their promo emails quite frequently. It turns out that these e-mails are a great boost of confidence in bad days, because they seem to invariably be written with the assumption that the reader as let his Japanese slip up, and needs their help to get back on track. There’s something quite satisfying in proving said e-mails wrong :). I purchased this and I’m reading it slowly because each page really makes me think. It’s funny, inspiring, and keeps me motivated, and isn’t to be rushed through. I’m trying to remember all this advice for when I get stuck or discouraged. Thank you! I had a bad patch last week and downloaded your Motivation power ups. These are brilliant! It really helped me get across a difficult bump. One of the stand-out things about your approach is the emphasis on motivation which I haven’t seen anywhere else. But really it’s the key to the whole thing. If you’re engaged, and you persist, it’s impossible NOT to learn the language! If you stick at it, and you’re covering content, you will certainly get there in the end regardless of method. The right method will give you a faster and smoother journey. But without motivation, you will give up, and not get anywhere regardless of any other consideration. The thing I like most about the Motivation Power-Ups is that this product exists at all. It’s curious that this most important factor is so under-served. I’ve only looked at the first half dozen or so. Everyone is different, so I found that some did nothing for me, but others really got me going. I was in a complete funk about Japanese. I’d had to travel over the weekend disrupting my routine, work went nuts and was keeping me late in the office every night, and I had a bunch of stuff going on. I was getting home at midnight and then grinding through Anki until 3am for several days in a row. I just got to thinking “I don’t have to do this. I don’t need to learn Japanese. Why am I doing this stupid thing?”. I figured that, for four quid, it couldn’t hurt to check out the Treasure Chest. If it proved a complete waste of money then so what? From this slough of despond, the power ups weren’t able to raise me to transports of ecstacy and unconquerable enthusiasm. What they did do was give me that slight nudge, that flicker of light, that kept me staggering forward for a few more days. That was enough to stumble over the bump and settle back into a steady routine. I’m very happy to hear the motivation power ups have given you that needed boost!